When I was 11 years old, I was transferred to an old-fashioned northern grammar school. This kept up the tradition of Latin and Greek, and Latin began at 11, and continued until 16. The textbook used was Paterson and Macnaughton, The Approach to Latin. This was actually the first volume of a three book series. It continued in The Approach to Latin: Second Part, and there was also The Approach to Latin Writing. I remember the Latin classes well. It was a devil to learn, but useful to know, and I was fortunate to have an excellent teacher. Schoolboys are hard on books. At some time in my later years there, the school disposed of unwanted copies of the last two volumes, to anyone who would take them away. 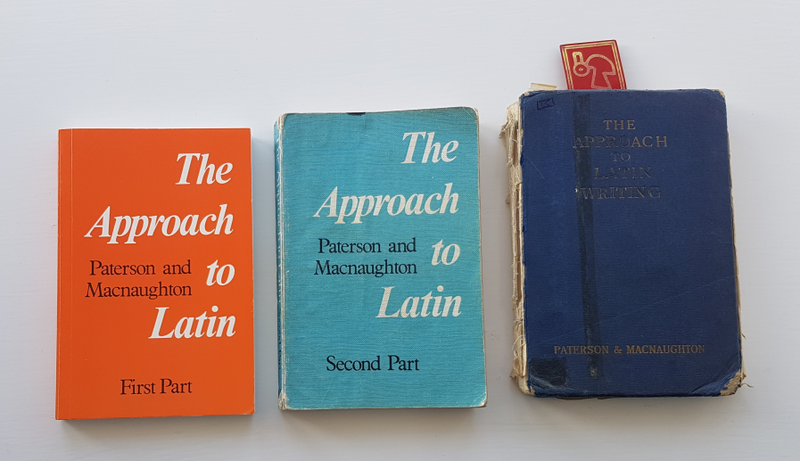 I picked up the latter two, and they lived in an old briefcase in my loft for many years until I brought them down a decade ago and shelved them with my Latin books. There was no opportunity to collect a copy of the first volume – the only one I ever used. But I was able to purchase a reprint in Cambridge in the late 1990s, from Heffers Bookshop, for £9.90. These little books must have been printed in tens of thousands, but how many remain today? Searching for copies online on Amazon and Abebooks, I was shocked to find that all these books are now sold for princely prices. One copy was offered at over $1500 today, which is ridiculous. I looked inside them last night, and took Second Part to bed with me, to read through the slender sections on Latin syntactical constructions. The introduction states that they contain “a selected minimum of grammar”, and this is very true. The vast bulk of the book consists of exercises. Each bit of grammar, often half a page, is followed by two or three pages of exercises. This is, of course, frustrating if you want hard information. The actual grammatical content is very concise. This morning I was reading a chunk of the Writing book, explaining something, and I wondered if there was a misprint! I had to reread it two or three times before I could work out what they meant. That the book was meant to be taught by a human teacher was evident. I do not believe that my schoolboy self could have decrypted that sentence. In this sense, it is not a good teaching book. I know that my old teacher preferred Coles, Latin Grammar Simplified. The exercises from The Approach to Latin I remember well. They started easy and became harder and harder. I loathed translating English into Latin. But in fact, it is clear that the authors’ intention was to prepare boys to translate from English into Latin, doubtless for examination purposes. This appears clearly from the grammatical material, now I look at it. The limited syntactical material is not well presented. But it caused me to think that I could extend the functionality of QuickLatin, my morphologiser, to flash up some possibilities whenever you see the word “ut” or “sicut”, or find a gerundive. It wouldn’t be hard to do that. At least, it shouldn’t be. QuickLatin was originally written in 1999, during a long and pointless government contract. It was written in Visual Basic 6, that much missed and easy to use tool that Microsoft sold at that time. From time to time I have tried to rewrite it in something newer; but always I have had to stop, and go and earn a living. Microsoft have never troubled to maintain their own tools, or to guarantee backward compatibility. VB6 was phased out in favour of the incompatible VB.Net, almost twenty years ago. VB.Net is now being phased out, with nothing to replace it. I did attempt a rewrite in Microsoft Visual C/C++, and got so far. When I came to pick up the project, a couple of years later, it wouldn’t even compile in the newer version of the tool. Of course 1999 was aeons ago, by modern software practices. Today everything is done with Test-Driven Development (although Microsoft never liked it, and their support for it in .NET was always rubbish). Everything is divided into classes and objects. VB6 stuff predates that. It was always hard to work with. Anyway, I’m stuck with VB6 code. You can’t even convert it to VB.NET, incredibly. Thus I’ve not put out a new version of QuickLatin in years. But VB6 continued to work on Windows 7, as I recall. I still have the disks for VB6. It is apparently possible to install this on Windows 10. But … for me at least … it has not worked. This is why computers are frustrating. You decide to do something and then, little by little, get led softly away from that into a Byzantine series of other tasks. The task I want to do is translate some Latin. To do this, I need to know more syntax. To help with this, I’d like to modify QuickLatin. To do that, I need to install VB6. To do that… I need to find workarounds. Maybe install a virtual XP machine. Which means… yet more stuff to do. All of which take time and prevent me doing what I actually wanted to do! And so another day disappears. In the last few days I have been looking at the Latin text of the passio of St Valentine of Interamna / Terni. It’s a while since I did any Latin translating. But the process always involves difficulty. These days it is very easy to determine the tense, number, case, gender and meaning of individual words, with tools like QuickLatin or Whitaker’s Words, or other morphologisers. Likewise the wide availability of dictionaries in PDF format makes it easier than ever to look up unusual words in specialised dictionaries. The next step is for these to emerge in an indexed electronic form. In fact a kind correspondent has sent me an interesting tool, in which you can search a wide range of dictionaries, where the start and end word of each page are stored electronically, and then you can display on-screen a bitmap of the page. Many problems require a flash of genius; and this is an example of it. I hope to write more about this in due course. But none of this helps you with a phrase which simply won’t make sense, even when you know all the words. This is because you don’t know much about Latin syntax. A lot of people know some Latin. A great number of people know enough Latin to do something with the tools above. Once you recognise the format, it’s not hard. You translate the accusative “se” as “that she”, and “she” becomes the subject of the new clause. You find the infinitive (“esse”, to be), and treat it as an indicative (“est”, is). After that, the rest of the clause is normal. There may be other words along for the ride, which don’t matter, as here with “bonam discipulum”. I have found by experience that few people understand this construction. My own knowledge of Latin constructions is limited. It wasn’t an important part of the Latin that I did at school. Something that we all need to work upon some more. I shall dig out a textbook and have a read! A kind correspondent wrote today to supply some obscure words in the ancient catalogue of the Regions of Rome (and their monuments) attached to the Chronography of 354. In the process I learned that a couple of really important dictionaries for Latin have come online in searchable form. The first of these is Felix Gaffiot’s Dictionnaire Illustré Latin-Français of 1934, which was quite unknown to me despite its importance. Various versions are online, as the Wikipedia article indicates – there is also a downloadable PDF -, but I used this one. Gaffiot is good for very obscure words that other dictionaries do not include. This had entries on such obscurities as “cochlis“, meaning a stair inside a column. The second of these is Du Cange’s Glossarium mediae et infimae latinitatis, 1883-7, online here. This is for medieval Latin. I shall add both as links on the right-hand side in just a moment! In the 19th century it was unremarkable for a scholar to publish his thesis or book in Latin. Many did so. After all, to obtain admittance to a university every student had to demonstrate competence in Latin. So every scholar should be able to read and write in Latin as easily as his native language. Let us compare this with the situation today. On the one hand, most students couldn’t compose a verse in Latin to save their lives. On the other hand, academics are forced to learn several other languages in order to study the academic literature. Every respectable modern academic must have a good reading knowledge of English, French, German and Italian. The standard of too many anglophone PhD theses suggests to me that most of the students writing know only one language, and that English. No doubt when they collect their PhD certificate and obtain a teaching post their command of languages improves instantly. Wouldn’t it be easier just to learn Latin really well?